Creators of the GURPS Character Generator! Imaginware now offers Reaper Miniatures at 20% off!!! Check out Imaginware's Combatulator!! A Must have for all GM's with a computer at their finger tips!! Check out Imaginware's Starship Builder!! Build your own starships from scratch!! Here is a sneak preview of the main character page. Check the Sneak Preview area to see what your character's will look like using Imaginware's GURPS Character Generator. This is the best generator out there!! 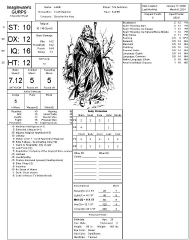 Creating GURPS Characters has never been so easy and fast!